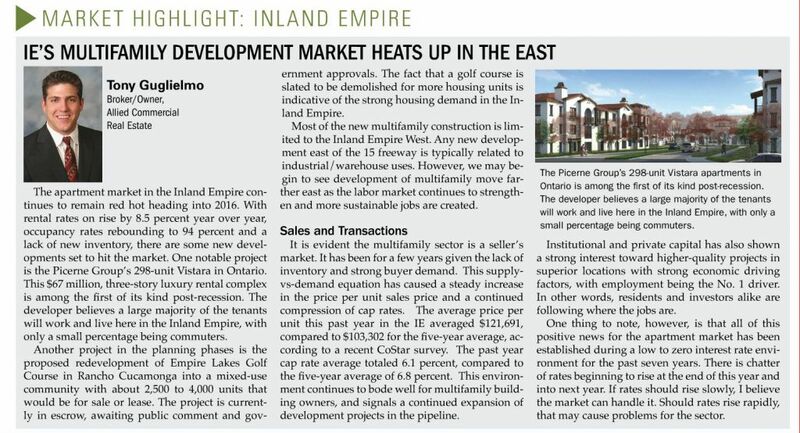 IE’S MULTIFAMILY DEVELOPMENT MARKET HEATS UP IN THE EAST - News - Resources - Allied Commercial Real Estate, Inc. The apartment market in the Inland Empire continues to remain red hot heading into 2016. With rental rates on rise by 8.5 percent year over year, occupancy rates rebounding to 94 percent and a lack of new inventory, there are some new developments set to hit the market. One notable project is the Picerne Group’s 298-unit Vistara in Ontario. This $67 million, three-story luxury rental complex is among the frst of its kind post-recession. The developer believes a large majority of the tenants will work and live here in the Inland Empire, with only a small percentage being commuters. Another project in the planning phases is the proposed redevelopment of Empire Lakes Golf Course in Rancho Cucamonga into a mixed-use community with about 2,500 to 4,000 units that would be for sale or lease. The project is currently in escrow, awaiting public comment and government approvals. The fact that a golf course is slated to be demolished for more housing units is indicative of the strong housing demand in the Inland Empire. Most of the new multifamily construction is limited to the Inland Empire West. Any new development east of the 15 freeway is typically related to industrial/warehouse uses. However, we may begin to see development of multifamily move farther east as the labor market continues to strengthen and more sustainable jobs are created. It is evident the multifamily sector is a seller’s market. It has been for a few years given the lack of inventory and strong buyer demand. This supply vs demand equation has caused a steady increase in the price per unit sales price and a continued compression of cap rates. The average price per unit this past year in the IE averaged $121,691, compared to $103,302 for the fve-year average, according to a recent CoStar survey. The past year cap rate average totaled 6.1 percent, compared to the fve-year average of 6.8 percent. This environment continues to bode well for multifamily building owners, and signals a continued expansion of development projects in the pipeline. Institutional and private capital has also shown a strong interest toward higher-quality projects in superior locations with strong economic driving factors, with employment being the No. 1 driver. In other words, residents and investors alike are following where the jobs are. One thing to note, however, is that all of this positive news for the apartment market has been established during a low to zero interest rate environment for the past seven years. There is chatter of rates beginning to rise at the end of this year and into next year. If rates should rise slowly, I believe the market can handle it. Should rates rise rapidly, that may cause problems for the sector.